THE LARGEST BLUETOOTH SPEAKERS COLOUR RANGE IN THE WORLD! 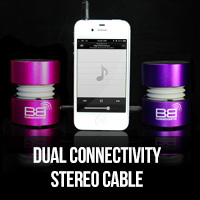 Connect two BassBoomz bluetooth speakers to one device for twice the power and twice the boom in spectacular stereo sound quality. Dual connection cable sold seperately. 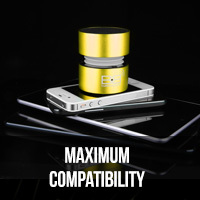 The bass expansion system can be closed up when you have finished listening to your favourite songs, allowing for an ultra portable speakers sound experience like no other. 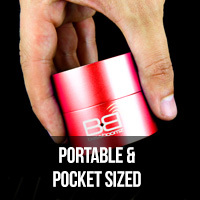 All bassboomz portable speakers come equipped with a 3.5mm AUX input as well as a bluetooth connection allowing you to connect up to any music playing device. 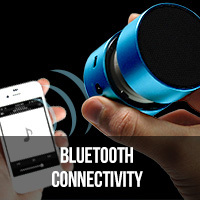 Portable and pocket-sized, BassBoomz bluetooth speakers create an impressive volume-to-size digital amplifier and are designed with a Li-ion rechargeable battery that lasts 5-6 hours at 70%, so they can be used while on the go. BassBoomz are perfect for every season - they can be taken on holiday, used at a picnic in the park with friends, or simply around the house. 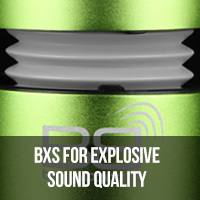 "BassBoomz is certainly one of those gadgets that not only looks great, but also performs at a very high standard." "It just blows all the rest of them out the water!" "The sound is fantastic compared to speakers of a similar size. It’s not one dimensional sound and definitely has a Bass kick." "The Bassboomz speakers have come along, filled that hole and stomped all over it. They are completely awesome. " " The entire room was filled with sound. The bass came through loud and clear and the sound was clear and sparkling." "Overall, a great little speaker with surprisingly full sound. A perfect, "go to" portable speaker for the Ripple life." " This little guy is incredible! Not only is this thing tiny (smaller than a tennis ball), the sound on it was louder and clearer than I ever expected. "